Uniform glossy black above along whole body except tip of snout which is paler brown. Belly has red or pink flush, brighter on the sides & paler in the middle. Hind edge of belly-scales is black, creating an even red & black striped appearance. 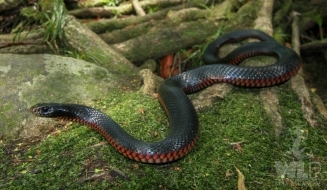 Belly colour is visible along flanks and sides distinguishing it from the Eastern Small-eyed Snake. Midbody scales at 17 rows. Wet habitats; rainforest, near water. Preferably grassy or rocky edges of watercourses, swamps, lagoons etc. Also seasonally inundated alluvial woodlands. Diurnal. Actively searches for potential prey. Primarily frogs, but also other reptiles (including other snakes) and small mammals. Reported to have suffered declines in numbers in some areas subjected to significant favored habitat destruction and also since the introduction of the Cane Toad. Readily turned up in inner suburbs but generally associated with suburbs supporting riparian (river margin) habitats. Could be typically associated with ground refuge such as timber piles, sheet iron, rock walls and heavy vegetation. Has been recorded climbing to take frogs but this is rarely encountered. A large freshly shed Black snake is truly a beautiful snake often even appreciated by self-confessed snake despisers.